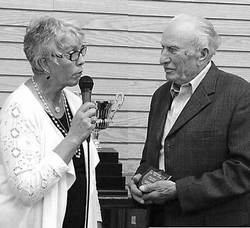 Cathy Lund, Chair of the Museum Board, presents Helmer Larson with his personal plaque as Pioneer of the Year, 2013.Helmer received the trophy with his name alone on a new side of the throphy. The opposite side has the names of all those who went before him. Helmer Larson was chosen as the 2013 Wetaskiwin Pioneer of the Year in the Community Builder category. He has spent his life building: building as a career, building a family, building sports organizations and outdoor rinks, building skills and leadership abilities in others, and building the means to preserve and display history. A great deal of his building he has done, and continues to do, as a volunteer. The Wetaskiwin & District Heritage Museum has been the major recipient of Helmer Larson's building skills for over 30 years. While his wife, Sylvia, was the visible leader as President of the Board and Manager of the Museum, it was Helmer who brought about the physical reality of the museum. Fully sharing the dream of having Wetaskiwin's history on display for future generations, he built display cases, worked alone or supervising others doing renovations, arranged and prepared for utilities tradesmen to do necessary work, converting first the Water Works Building, then the Montgomery Department Store into museum space. He learned about the environment necessary for the proper museum handling, storage and display of artifacts, and built and renovated accordingly. Now he continues to take care of maintenance of the museum and to do any building or renovating needed. He watches for useful items which he keeps in the little building in the parking lot, and has asked for an addition to that little building. Often the Manager will comment that “such and such would be nice” and it appears shortly after, adapted from something Helmer has stored in his shed. Those who attend the larger gatherings at the museum appreciate the way he quietly makes sure that there is a chair for everyone. In recent decades the museum has benefited most from Helmer Larson's expertise, but when the old Courthouse was renovated to become the new City Hall, he was instrumental in the beautiful refinishing of the the original wood and furnishings and different uses for some things, such as the original doors which are the backs to the aldermens' tables. Born on February 24th, 1927, the son of Swedish immigrants Algot and Ragnhild Larson, Helmer grew up on a farm north of Gwynne where he acquired the rural values of hard work, cooperation, neighbourliness, and ingenious problem solving. While young, his father taught him to play baseball, and he learned to play hockey in pick-up games on Lindee's slough near Offerdale School. In baseball, he became a very good short-stop and played with the Central Community team which won the league title several times. Other Wetaskiwin teams sought him as a player, and later he supported the softball pursuits of his daughters by coaching, umping, and even providing uniforms for a girls' team. In hockey, he played with the Old Timer Relics until well past 60, and organized the league for players 35 and over. His business, Larson's cabinets, sponsored his team, buying the jerseys and socks for the players. When an opportunity came to go to Holland for an International Old Timers' Hockey Tournament, he lead the fund raising to make sure that every team member could go. He and other hockey players voluntarily built outdoor rinks for the city during the '70s. When Bethany Homes for Children needed help with interior finishing and decks on duplexes, he gathered volunteers to help him do the work over one winter. A member of the Kiwanis Club, he was named the first Chairman of the Wetaskiwin Kiwanis Music Festival, with his wife, Sylvia, the Executive Director. He has consistently used all that he learned and all of his experience to help build his community, making it a better and more interesting place to live with more things to do. He is a very worthy Pioneer of the Year. Congratulations!